Hair loss affects around 50% of people in the UK and can be a very traumatic experience for both men and women. Having a full head of thick, luscious hair is often seen as the beauty ideal with many magazine spreads even being photo shopped to show a healthier main than even some models are naturally capable of. Losing your hair not only makes you feel self-conscious about the way that you look but it can also impact you negatively in the way you think about other aspects of your life such as aging or relationships. Thankfully new developments in technology in this area has meant that those who suffer from hair loss can now find a permanent solution through hair transplants. With such significant advances in hair transplant technology over the past decade and higher success rates, the number of people seeking either Follicular Unit Transplants (FUT) or Follicular Unit Excision (FUE) treatments has dramatically increased in recent years. With high profile public figures, such as Wayne Rooney, showing that getting something done about hair loss isn’t something to be ashamed of, more and more people are turning to these advancements in this area to also improve the appearance of balding or thinning hair. If you have experienced hair loss, then a trip to the barbers or hairdressers may have previously filled you with dread as you tried to find a style which does not extenuate the problem and face the comments the person cutting your hair is likely to make regarding the thinning areas of your scalp. For many of those individuals who have undergone a hair transplant and are now enjoying a much fuller head of hair and a much higher level of confidence, one of the first things they want to do is visit the barbers or hairdressers and get a fresh new style cut in. However, before you head straight to get your first hair cut post-treatment, there are a few important things you need to know. The first month after a hair transplant does require you to give your scalp and hair a little more care and attention than you would normally. Particularly in the first week, you should use specialist shampoo on the treated areas while the scabs heal, and the hair begins to grow. You should aim to be more gentle when you wash and dry your hair too, ensuring you are not being overly vigorous with shampooing or towel drying. It is advisable not to use a hairdryer to dry your hair in this time also. However, your normal hair will continue to grow, which if you have a particularly short haircut, can make the donor areas more noticeable. But the good news is that after around three weeks you can safely get your hair cut without causing any damage to the transplants or new hair. Having said that it may be advisable to visit your hair transplant physician before you cut your hair to ensure the head is healing properly. 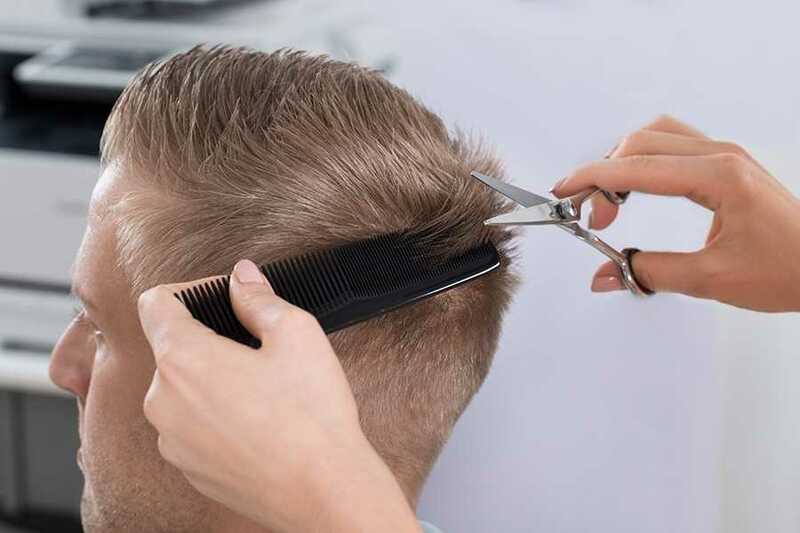 If the healing process is a little slower than normal and there is still some redness, swelling and scabbing, it may be advisable to wait before getting a new haircut, as this could aggravate the area and slow down healing even more. However, your hair transplant physician will be the best person to advise on this as your hairdresser/barber may not have any experience with hair transplants before, so it is better to take the advice of a specialist. What type of style can I go for? The honest answer to this question is: any style you want. Providing your scalp has healed correctly, the risk of dislodging hair transplants is very minimal. Therefore, you can opt for any hairstyle you choose. Some men who have had a hair transplants often decide to shave their hair very short when they go for their first hair cut so that any difference in length between their natural and donor hair is no longer visible and it can then continue to grow at the same length. Another option is to go for a more voluminous style to cover up the areas of donor hair which is still recovering and growing. Essentially, your first hair style with your new hair is entirely down to personal choice and now that you have more hair to play with, you can enjoy the entire process of finding a style to suit your new look again. In addition to your haircut you may also be eager to get back to using styling products, chemical dyes or heat treatments to get back to your old style. However, just like the haircut, it’s recommended to avoid these for at least 3-4 weeks. Certainly, with hair drying, the transplant area may still be numb so there’s a risk of burning and excessive heat can damage new follicles and the scalp may become burnt and damaged if exposed to prolonged heat. Furthermore, with chemicals and styling products the new follicles may be more sensitive in the initial growth stages, so there’s a possibility they could react adversely to products. If you are planning on colouring your hair, then you should wait at least 4 weeks and check with your hair transplant physician before doing so. You should also ensure you do a patch test even if you have used the dye before as the new hair follicle may react differently to the dye. For more advice on hair transplants and aftercare, the Wimpole Clinic is always here to help.